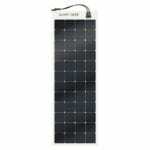 SOLAR SEMI FLEXIBLE PANELS (or semi-rigid) are rugged and designed for use in the harshest environments. They can be permanently fitted and even walked on. Perfect for boats, motor-homes, caravans and expedition use. Our Semi-Flexible Solar Panels have been specifically designed for marine and extreme environments and so are built to the very highest quality standard of materials and workmanship. The solar power range covers low to medium battery charging requirements, effectively maintaining batteries whilst away and typically replacing some of the power consumed whilst on board to larger modules suitable for live-aboards assisting in keeping the refrigerator and other appliances running. The semi-flexible Solar range boast one of the highest efficiency cells in the World with efficiency levels up to 21.5%, meaning higher power generation of between 25-30% more than conventional PV modules of the same size. Light weight design combined with high efficiency cells and solar panel flexibility makes our latest semi-flexible solar range also perfect for marine use and many more applications where a rigid framed solar panel is not an option.